Caramel Apple Cheesecake Bars are creamy, sweet and super delicious. These are a guaranteed crowd pleaser! Whenever I make a new recipe at my house I ask my husband to rate it. Like on a star scale. One star being, awful, four stars being YESSSS. Here’s the problem, though. We never actually GET to the recipe rating, because we always end up arguing over the rating system. The husband thinks there needs to be more than 4 stars on the scale…at least 5 stars, he says. But I already made the 4 star system and have actually RATED the recipes in cookbooks…SOO, the rating system is here to stay. I mean, you can’t change a system that’s already in effect…What if the Olympics decided to start giving Platinum medals? All those former gold medals wouldn’t be so important anymore. We’d have to start using *asterisks* next to the ratings, to show whether they were pre-change or post-change. And then what if one day you learn that this will be your final meal and you scroll through the cookbook and pick a four star recipe, only to learn that it was marked BEFORE the switch, and now you’ve just wasted your final meal on a “pretty good” lasagna. That sounds like possibly the worst scenario ever. Alls I am saying, is that whether or not the 4 star system is the best…which hello, it totally is…we can’t change it mid-adulthood. So, short-story -long, I want to share with you my final recipe for Caramel Apple Week. Which is totally a 4 star-that-should be 5-star-but-is-staying-a-4-star recipe. In other words, it’s final-meal-good. First make your crust. And you get to use your pastry cutter, if you have one. I’m always looking for a reason to use mine. I know, I’m weird. Press your crust in a lined 9×9 and bake it up. And don’t forget about the streusel. Nobody puts streusel in the corner. Layer the apples and then the streusel. Now it’s ready to make the journey into the oven. 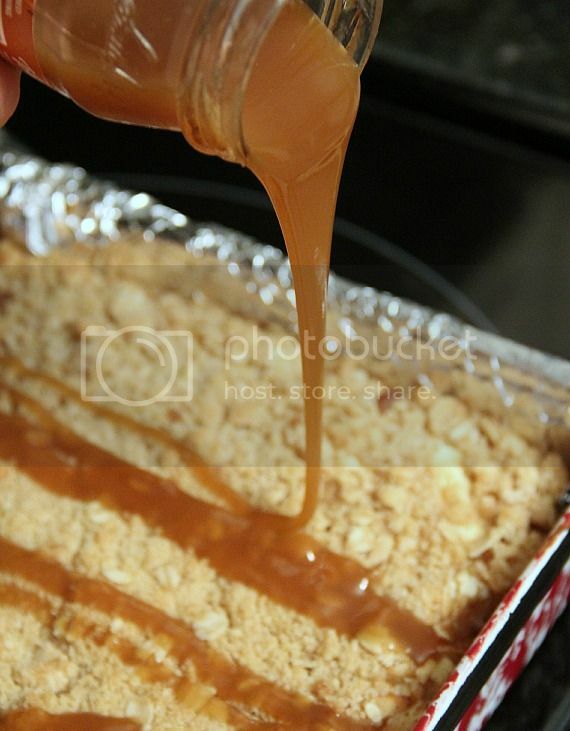 When it’s baked and almost perfect, you need to pour some caramel on top. You neeeed to. And then you have to let it sit for a while to cool. It’s excruciating. But OH so worth it. I wrote this recipe originally back in 2012, and knew the finished product photos needed a little sprucing up…and to remind you guys how AMAZING these bars are! Enjoy! Line a 9×9 baking pan with foil. 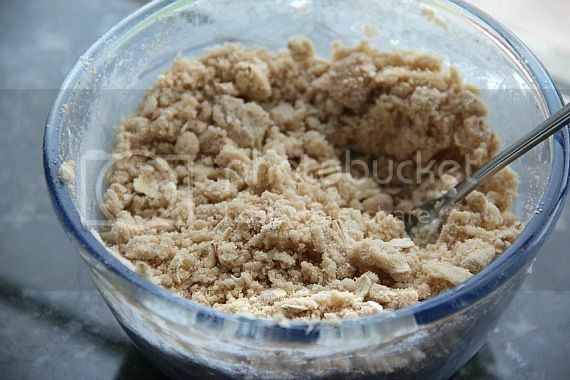 In a medium sized bowl combine crust ingredients, flour, brown sugar and butter. 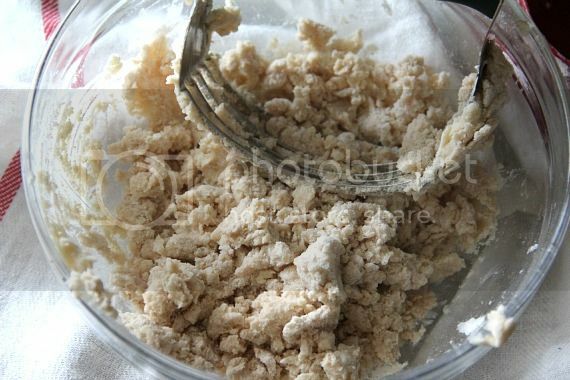 Using a pastry cutter, or fork combine the ingredients until they make a coarse crumb. 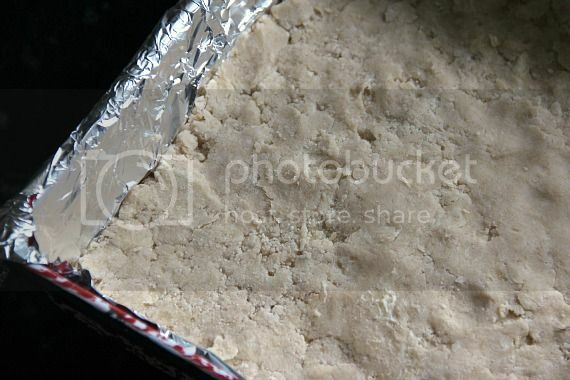 Press mixture firmly in the bottom of the pan and bake for 12-14 minutes until lightly browned. 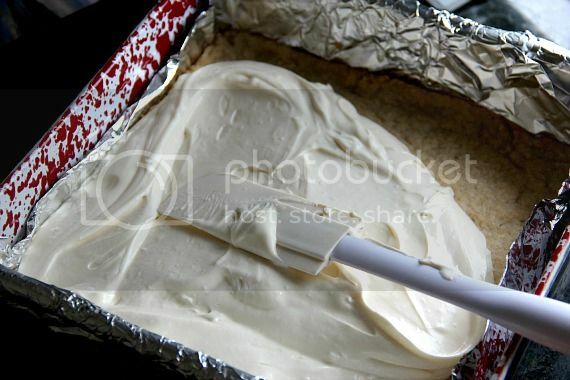 Meanwhile, in a mixing bow, combine cream cheese, vanilla, egg and 1/4 cup granulated sugar. Beat until combined and smooth. Set aside. Dice apples and sprinkle with remaining 1 Tbsp sugar and 1/4 tsp pumpkin pie spice. Stir until coated evenly. Set aside. 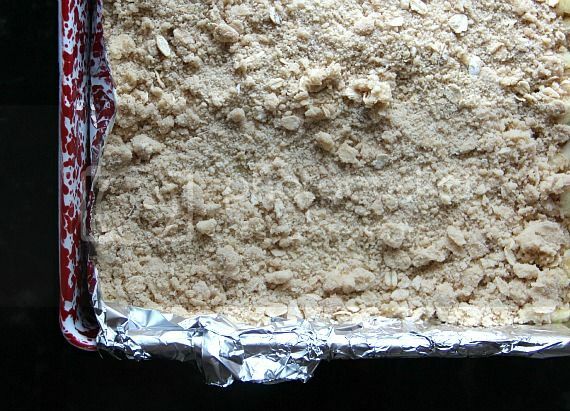 Make streusel by combining all ingredients, light brown sugar, flour, oats and butter and stir with your pastry cutter or fork until evenly mixed. Set aside. When crust is done baking, spread the cream cheese mixture on top of warm crust, top with diced apples and finally with streusel. But back in oven and bake for 25-30 minutes, until center is set. When done drizzle caramel sauce all over the top. Let the pan cool on a wire rack for at least 30 minutes and then place in refrigerator to chill for approximately 2 hours, or overnight. Cut into squares when ready to serve. 36 Pumpkin Recipes for Fall! 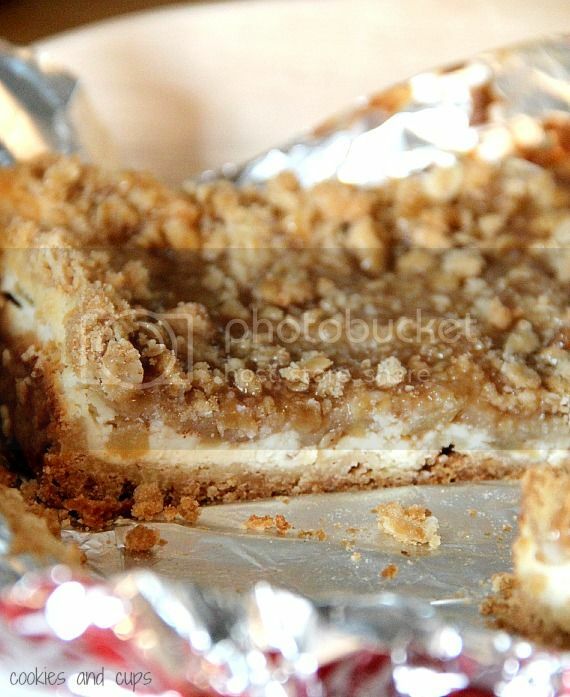 Cheesecake and streusel and caramel and apples, mmmm, this sounds so good! I could also see eating these every single day, whatever the rating scale is! WOW– these look amazing. I am checking the pantry this afternoon and making them this weekend!! Thanks for another great post! Another awesome caramel apple recipe! You’ve done it again. Whatever the rating scale, I know I’d give these the highest possible score! I definitely want to eat those every single day of my life!!! I love cheesecake everything!!! Perhaps things need to get more specific around here. Well, I hate to agree with a boy, I do agree there needs to be an extra star. That is just a huge jump from horrible to perfect in 4 little stars. Like, there’s horrible, bad, good, perfect? Where is the “just okay” rating? That said, you totally can’t change the system now. You are LOCKED IN. Love these bars. I give them 5 stars. Those look SO delicious! I plan on making them this weekend-thanks! They look so decadent! Crunchy, buttery and divine. Breaking News: Your recipes will ALWAYS be four.. or five (whatever’s one is tippy top, okay?) in my book, so if that’s any consolation, you’re welcome. I need to have my face in these bars. Looks amazing, as always Shelly! My favorite thing growing up was my mom’s cherry cheesecake bars. She’d only make them a couple times a year because they were special and we’d eat the entire pan in a snap. This reminds me of them. Just beautiful. These bars look totally amazing!! I’m sure they are worthy of 4 stars AND a gold metal! That sounds exactly like my house!! I almost agreed with your husband about needing more stars, until I read your rationale and realized that you are absolutely right…you can’t change things at this point. Can’t wait to make these squares very soon. My husband’s palate is very limited so I don’t even let him rate my food anymore. Bars are so much fun to make! I would probably eat this whole pan as my final meal. That seems reasonable, right? I can’t wait to try these! Look so good. Thank you! Woman, you rock…You make me laugh and that is a def. 4 star! Another great Caramel Apple recipe. I’m going to be so sad when this week is over! I can’t wait,because i become very hungry to see it. Really this recipe is very delicious. Thanks for your excellent article with beautiful picture. I wanna eat that caramel sauce with a spoon! These look wonderfully delicious! This looks amazing! As do all your recipes. Thanks for sharing! love so many things about today’s caramel apple recipe Shelly! Using my 8×8 pan is always preferred over a huge batch of whatevers in my 9×13 pan. I also am a SUCKER for apple dessert. Plus cheesecake. And I want to eat that streusel and caramel with a spoon! These sound fantastic and a perfect way to start Fall! I will definitely be making these soon…the ingredients are already on my shopping list! i think i love you. these look super-fabulous-amazing-crazygood. Ah to die for! But I’m laughing at the star system..I get it and get the argument. You can’t change it!!! It looks so yummy! Definitely a 4 stars recipe. Though, I hate to say this, but 4 stars aren’t much really. Maybe you could try to migrate them to a 1 to 10 scale? These look amazing. Mabe better than 4 stars but since that’s the best, I’ll say four for sure!!! Wow, this might be the best of all your caramel apple recipes yet! What an awesome combination of cheesecake, sweet caramel, and crispy apples! these are definitely a 10. i hope i didn’t ruin your rating scale. in any case, this was the best week ever. i LOVED this series and gave me so many ideas for apples this month! there are so many lovely things going on here! I don’t even know what part would b e my favorite…but these definitely look pastry cutter worthy! Oh holy heaven! This is way better than eating the real thing–caramel apples always get stuck in my teeth. I want to live at your house. Seriously. I love cheesecake and I love caramel apples. Both can be a bit tricky to pull off perfectly. Your recipe fits in perfectly because you get both flavors without all the trouble! My pan of carmel apple cheesecake bars is in the oven RIGHT NOW! and they smell amazing…cant wait to taste them! The recipe was very easy to follow. I made these tonight……and I’m not sure how I can wait until the morning to try them…haha! Cheesecake anything is up my alley like a fellow commenter said. Love your recipes!! These bars look so temptingly divine!!! Such a great week of recipes! This recipe and your presentation look so good. I have already asked a few of my friends to try either your recipe or paula’s and I am going to Blog about them in November. I can’t wait! We made a very similar recipe to this — and loved it!! I have made these twice now. One of my favorite desserts of all time I think…and I am normally a chocolate person! I accidentally did cinnamon instead of pumpkin spice the first time around and went ahead and added the pumpkin spice in addition to the cinnamon. OMG-soooooo good. So this is how I will always make it, don’t even need to see if the original way is better because there is no way that it could be. Thank you for sharing this wonderful recipe! Can I double the recipe to make a 9×13 pan of this? How did it turn out by doubling and using the 9×13 pan? I only have a 9×13 pan and want to try this out. These look amazing and I will try them soon. I will not be using Granny Smith apples. Could someone please tell me why so many recipes call for them. There are so many really good cooking apples out there. Granny Smith just do not cook up, ending up crunchy and too tart. I agree. I am fond of Fuji and Red Delicious. Sweeter, but they hold their shape. Hi Shelly! I just wanted to post a quick note about these bars. They are delicious! I can’t keep out of the pan of them! Thanks for sharing this recipe! I made these bars in the Fall and they were excellent!!! I made them yesterday and instead of the diced apples in sugar and pumpkin pie spice, I took a can of cherry pie filling cut the cherries in 1/2 and stirred in 1/2tsp. of almond extract. I spread it on top of the cheesecake layer and then finished with the streusel. I did not use the caramel sauce. They were outstanding also! Thanks! These look great, and I’ve been waiting over a week to make them. However, for some reason, when I went to bake them today, the recipe had disappeared. Is there an issue with the site or is it me? I was had a glitch with my recipe service earlier, sorry for the inconvenience! should be working! can I use Macintosh apples that is all I have right now? Sure, it will be fine! I like the tarter, firmer texture of the Granny Smith, but in a pinch The McI will be fine! also can I use a 8×8 pan I don’t have a 9×9 pan? Thank you so much for your quick response!! This is on my to do list for today!! !God Bless!! I happened to use salted, because that’s pretty much what I always use…but unsalted will be FINE!! You might need to adjust the amount of salt you add, adding 1/4 tsp-1/2 tsp more…but just do it to your own taste! Could these bars be frozen?? I do a ton of baking each month for our church bake sale, and I try todo as much ahead as I can. I would love it if all recipes came with a note stating if they could be frozen. This one sounds so delicious and it will be first on my list for this month!!! These were by far the best dessert I have ever made, thank you so much for the recipe! I do have a couple of questions though. I made these yesterday with Granny Smith apples like the recipe calls for, but would it make a huge difference in taste to use two macintosh instead? I have so many of those left and am looking to use them up. Also, my streusel came out very moist and looked darker than yours did in the picture. Tasted absolutely AMAZING, but just looked different even though I used the same ingredients. So I guess my question is, is it supposed to be super moist or more dry of a topping? I used my Braeburn apples and it was a hit! 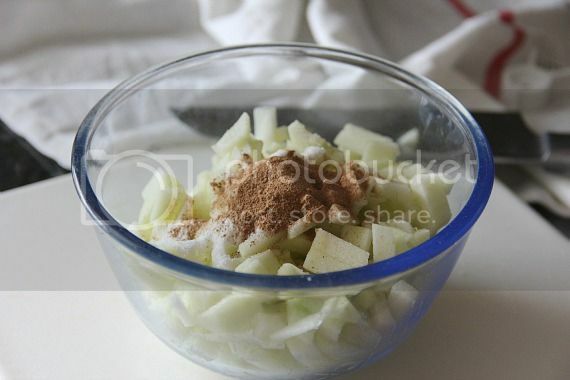 I’m fairly certain ANY kind of apple would taste great in this recipe…Thanks for posting! I’m going to use it again for Thanksgiving with the family! Great!! So glad to hear! I’m planning to make these this weekend. Would you recommend drizzling the caramel sauce after chilling and just when slicing and serving? Or is it more important for the streusel to absorb it? I’m making my own caramel sauce and was thinking it might make the streusel soggy if I drizzle it after baking and before chilling. Thank you! I would definitely wait until you’re ready to serve! It will absolutely absorb into the streusel if you do it ahead! These are delicious! Thank you so much for sharing the recipe. I’ve already made them twice this month! Love it! So glad you like them! This is a perennial favorite with my co-workers, especially the ones with Autumn birthdays! It is always gone before lunch.